The holiday season is full of family, friends and food. Whether it’s at work, a party or gathering with your loved ones, temptations grow exponentially this time of year. It may be easy to get off track and indulge, but with a little planning and encouragement, you can maintain your weight during the joyful season. 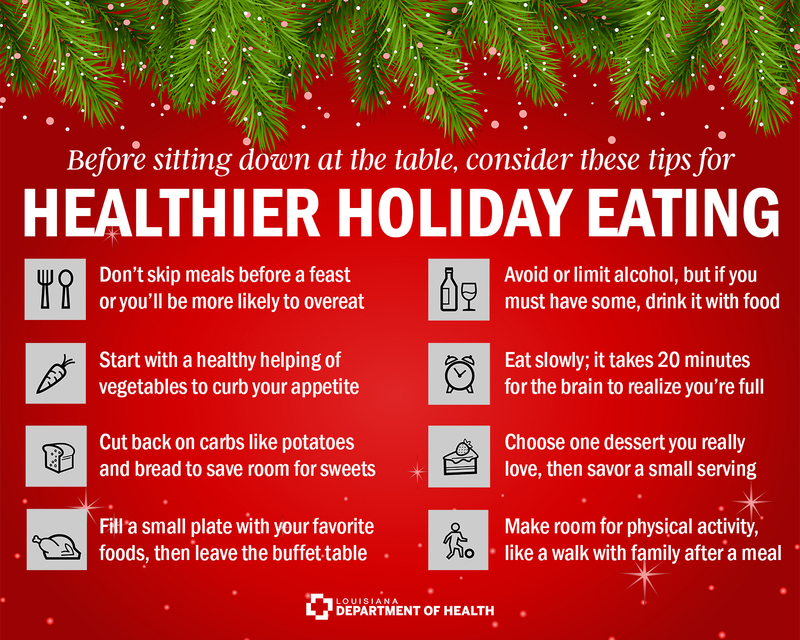 You can anticipate a slew of tasty foods on holiday menus, so prepare in advance for good eating. You’ve got this! 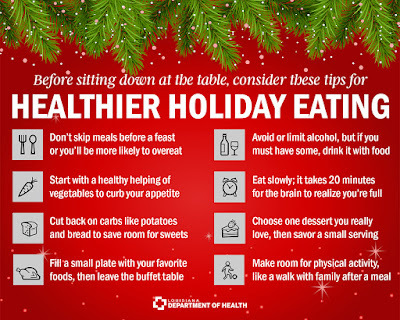 Don’t skip meals before a holiday feast. Skipping meals may cause an increase in hunger, which may lead to overeating when mealtime does arrive. Also, skipping meals makes it harder for those who with diabetes to control their blood sugar. To prevent this, eat close to your usual times and have a small snack if the big meal is served later than you’re used to eating. The best snacks are high-fiber foods, lean protein and healthy fats – try apple slices with peanut butter or a slice of turkey with cheese on a whole-wheat pita. An easy way to play by the rules is to bring a healthy dish along to a party. There’s bound to be lots of sweets and high-calorie dishes on the menu, so try serving vegetables, or opt for recipes that are light on butter, cream, lard, vegetable shortening and other ingredients full of saturated fats and cholesterol. Remember the importance of sleep. A lack of good sleep makes it harder to control blood sugar, and sleep deprivation often leads to us craving foods high in fat and sugar. So get those Zzz’s. Thinking of all the delicious foods on a holiday table is enough to make your mouth water, but you know the old saying – your eyes are bigger than your stomach. Choose a small plate of your favorite foods, including a healthy selection of fiber-rich foods like fruits, veggies and whole grains that will help you stay full longer. Consider putting fewer carbohydrates, such as potatoes and bread, on your plate and plan for a single dessert at the end of the meal. Fill a small plate, then walk away from the buffet table. Put some distance between yourself and additional temptation. Finally, it’s time to eat! It takes at least 20 minutes for your brain to realize your stomach is full, so take your time and savor your food. If you feel like going back for seconds, try drinking some water and waiting 10 minutes first to see if you really are still hungry. Don’t put any foods on the naughty list – instead, try to choose ones you really love and aren’t able to get any old day, such as your aunt’s famous pumpkin pie. Have a small serving and enjoy it. If you’re having an alcoholic drink, have it with food. People with diabetes should keep in mind that alcohol can lower blood sugar and interact with their diabetes medications. Remember to check your blood sugar more often during the holidays. What’s a holiday meal without a nice nap after? Instead of an afternoon siesta, make some memories with your loved ones by incorporating some physical activity. Play a game of football in the backyard, go for a walk with family or take a bicycle ride around the neighborhood. Find more ways to get active at Well-Ahead Louisiana. Physical activity doesn’t have to be saved for after meals, though. The holiday season is busier than usual for most people, so physical activity often gets shunted to the side. Make it easier by breaking your physical activity up into smaller chunks and fitting it into your schedule when possible, like a short walk several times a day. For more healthy lifestyle advice, visit Well-Ahead Louisiana. Here’s to a healthy and happy holiday season.